Plus Corporation has a way of regularly outdoing themselves! I would like to introduce their new Guard Your ID Advanced Roller. An economic and eco friendly way to protect yourself from Identity Theft and Scams. Knowing you need to protect yourself against a potential predator is the first step to ensuring you do not become a victim. The most important way to protect yourself is by securing all your mail. This includes incoming and outgoing mail from your home or office. I’m sure you hear all the time how thieves victimize you online by sending spam emails to hack into your computer unknowingly. As this is a real problem, the fact is that stealing your mail continues to be the most frequent method used by an identity thief. The Below Data is supplied using the Statistics from the Bureau of Justice Statistics. Identity Theft is a real thing and the number of victims continues to climb year after year. The number of elderly victims of identity theft increased from 2.1 million in 2012 to 2.6 million in 2014. About 14% of identity theft victims experienced out-of-pocket losses of $1 or more. Of these victims, about half suffered losses of less than $100.  Half of identity theft victims who were able to resolve any associated problems did so in a day or less. Based on the statistics, the use of a Guard Your ID Advanced Roller while discarding mail could have eliminated the risk of being a victim. Nothing is 100 percent foolproof but the use of the Advanced Roller could have mitigated those results greatly. Plus Corporations- Guard Your ID Advanced Roller is a perfect example of taking a complicated problem and resolving it with a simple solution. 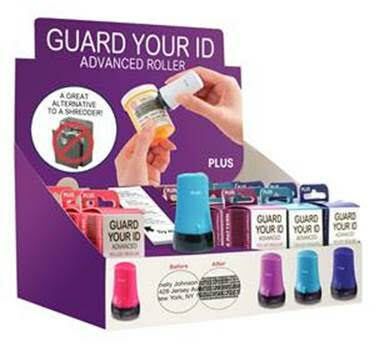 The Guard Your ID Advanced Roller was created with a special purpose. To ensure your personal information could be hidden on documents that provide information that you don’t want ever distributed. For example, medicine bottles, junk mail, credit card offerings, or bills you would like to discard. You simply roll over the information you want hidden and discard into the appropriate recyclable. It’s that simple! No expensive shredder, no wondering what to do with the shredded pages, just simply roll over the information and discard to the appropriate recyclable. Done. A new level of protection. Good for prescription bottles & magazine covers. Specially designed compound pigment- and oil-based ink. QVC– $19.99 offering 243 amazing good reviews! GLUE TAPE NOW AVAILABLE AT YOUR LOCAL BED BATH AND BEYOND STORE! 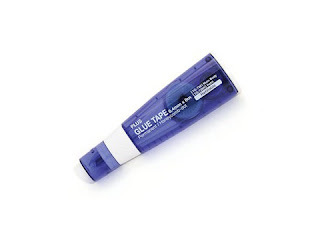 Glue Tape from Plus Corporation is the perfect 2 for 1 special, turning messy glue into double-sided tape for easy, neat, and clean application. PLUS has manufactured all their glue tape to meet the demands of todays’ consumers. Using only photo safe and acid free adhesive making their products perfect for photo albums and scrapbooking. All glue is odor free and PAT tested to meet the needs of the home and office. The adhesive tape in each model is unique and rated higher than other top brands for adhesion, separability and speed dependence. 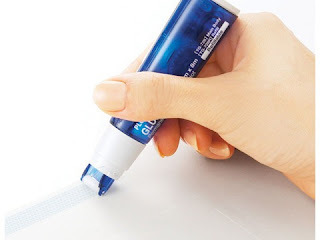 All applicators are designed for single handed use and the glue dries quickly making it perfect for craft and home use. 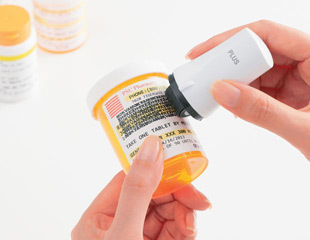 Plus uses a padded roller tip on all products to provide a clean application with no adhesion or surface translation problems. Flip back locking cover – Protects tape from dust and contaminants. Tension control torque applicator – Provides even resistance from the beginning to the end of the roll. Clear housing – Shows colorful internal parts. Padded roller applicator- Provides cleaner application of glue to uneven paper surfaces. Ask us about the new Glue Tape Series from Plus Corporation. Whether its for gluing on paper, wood, plastic, or metal, you’re covered! AVAILABLE AT BED BATH AND BEYOND – check your local store!! >The Kes’pon Guard Your ID Stamps and Refill are now at Bed Bath and Beyond! >The Guard Your ID Stamp effectively hides printed information with a unique pattern of special formulated permanent ink, to mask private and confidential information. It’s convenient and light weight design makes the Guard Your ID Stamp a very easy and affordable alternative to buying expensive and time consuming shredders. When it comes to identity theft, the better you look on paper, the more likely you are to be targeted by people with bad intentions. There is an endless amount of ways for a thief to steal your identity; and it all starts with the thief’s ability to get access to certain key pieces of information that belong to you. Using the Guard Your ID Stamp is also more convenient, less messy and less noisy than using a shredder. Refill cartridge sold separately. Now available Online and In-Store at Bed Bath and Beyond!